I have been furiously working on the baby blanket this past week. The simplicity is soothing since my home has been filled with kids visiting and wedding planning. Yup. We are getting closer to the July date and more items are added to my "to do" list each time I walk by. I don't know about you, but I get more motivated to tackle that list and have great joy crossing items off. I am still reading the second book of the Stone Gap Series by AdrianaTriagiani Big Cherry Holler. I am enjoying the story so far. 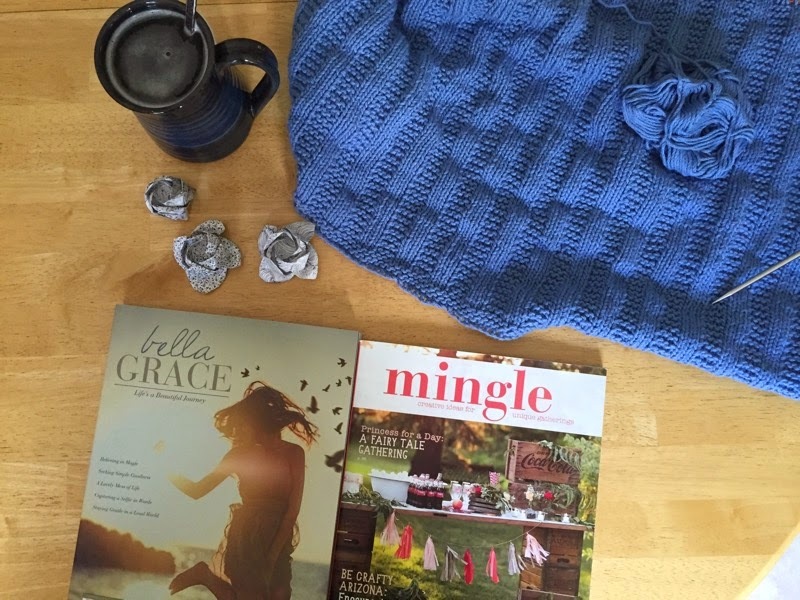 I picked up the new issue of Bella Grace and Mingle. The first is for nurturing my soul and the second magazine is for some ideas for the luncheon I'll be hosting the day after the wedding. Wow you've made such progress on your blanket! It's looking great. I love the look of those magazines - are they U.S mags? I think so. They are lovely to flip through! that blanket is flying along!!!! Looking great! never heard of either magazine and we get most of the US magazines up here in Canada. Your blanket is lovely. Exciting times, the wedding will be here before you know it. The blanket is really coming along nicely. Me neither - never heard of either of those magazines and they look great! The blanket is looking wonderful - gorgeous blue. Bella Grace - I'll have to look that up. Yes...you must be getting excited about the big day...and it's inspiring to know that you are getting lots done on your list. Sounds like you have a busy summer planned! I love the color of the baby blanket. Glad you are finding a bit of time to read, knit and relax. Enjoy this week! Looks like some great progress on the baby blanket! And some exciting summer plans coming together :) Hope the wedding planning continues smoothly! That blanket looks like great comfort knitting. Kinda gets you to your happy place! I think I am going to start reading the first book in the Stone Gap series. I have heard so many good things about it. Such a lovely color your baby blanket is! I have a son getting married in August and being the mother of the groom this time around is so much less stressful than being the mother of the bride which I was 9 years ago! Still, we are working on some house projects as we have quite a bit of out of state family coming! This week we are having our much needed new roof done-and I think next up will be the redoing of two bathrooms. I did not do a Wednesday blog post, but on my needles are a Stephen West shawl and also a color work hat in Seattle Sounders (soccer) colors for my son. I am reading a different Trigiani novel, The Shoemaker's Wife. It is an epic novel, spanning two continents and two world wars. I sure love reading her books! everyone is from out of town for both sides of the wedding. My house will only sponsor my son and the bride :) I figure we have too much going on that weekend! Just finished Beautiful Eyes about a Father who learns from is daughter about Down Syndrome. Sweet short and interesting. The blanket is coming along nicely and the magazines look really interesting. I can't wait to see what ideas you'll come up with for the luncheon. I'm still knitting on my shawl, but the book "Chasing fireflies" has totally captured my interest right now, so there's not that much knitting going on. I love your blanket! It's so lovely!! Our girls are in two weddings this summer- one is my brother's which my mom mentioned above! Such exciting times!! well done with the blanket progress! so much going on for you right now! God bless all these plans and events! I keep thinking I should tackle a blanket design. So many options. Yet, so much yarn! I just started reading Inside the O'Briens...not sure if I like it or not yet. Your blanket is looking fantastic. The color is so vibrant. 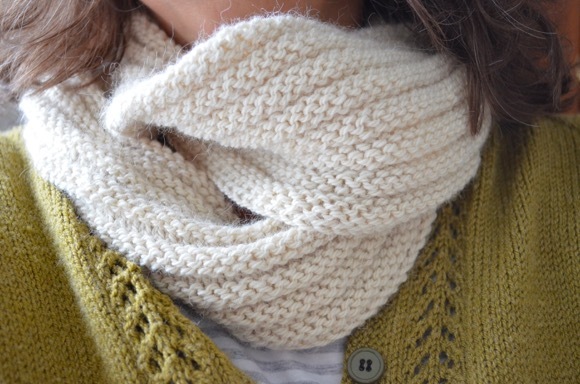 I admit, I keep growing my "to knit" list. I need to calm down. How exciting that your daughter will be married so soon! Beautiful blanket. 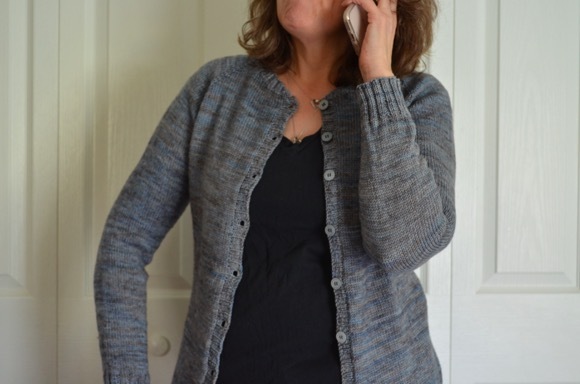 You got me thinking about my SIL's wedding and the couple of jobs I still need to do! You are making quick work on the blanket, it looks great. I am so excited about the upcoming wedding, it won't be long! That wedding is right around the corner! Our three oldest all married within a year of each other which was...crazy. Enjoy each moment, Karen, and have fun planning that luncheon! I love the simplicity of the blanket. I'm going to remember that for the next baby blanket I make. Which should be soon. Three babies due August to October. Your blanket is looking great! So exciting about the July wedding. Keep crossing those items off the list. So satisfying. I love both those magazines, too, especially Bella Grace. My kids are in their 20s and there is no sign of any weddings any time soon. Not sure how I feel about that!